The 34th edition of ESCT is about to start and this time we are traveling to the west of Europe, specifically to the city of Bucharest, 🇷🇴 Romana. Just since this moment, you can start posting your entries and the results of your national finals, clues about your entries or artists, etc for ESCT34. There's enough time to make public your entries until next Wednesday, April 17th. Deadline : Wednesday, April 17th 11:59 pm (CET).. If you need help to find some songs, you can check the Song Suggestions thread. Along with your song, you can also add the timeslot or the recap (+25 seconds) that you want to be heard in the Semifinals or the Grand Final. PLEASE, before sending any song, you must send your entries for approval to the council members (Alexito, Catch_a_falling_star, Rodrigueseve, Varlto, Le Hérisson) in order to check if your song is accepted to participate in this edition. Songs can be posted once they're accepted. its a song, from germany! Morocco are pleased to announce the return of our only winner Faouzia with her newly released song Born Without a Heart! North Macedonia Calling, After 18 songs fought a battle at Konkurs in Skopje, we decided our winner is Generdyn ft Fjøra, Can they help us get out of the quarter final and into the final? We will see in Bucharest. Generdyn, is an Australian singer from Brisbane Australia. He has worked with many artist including Zayde Wolf (who has also worked with Fjøra). 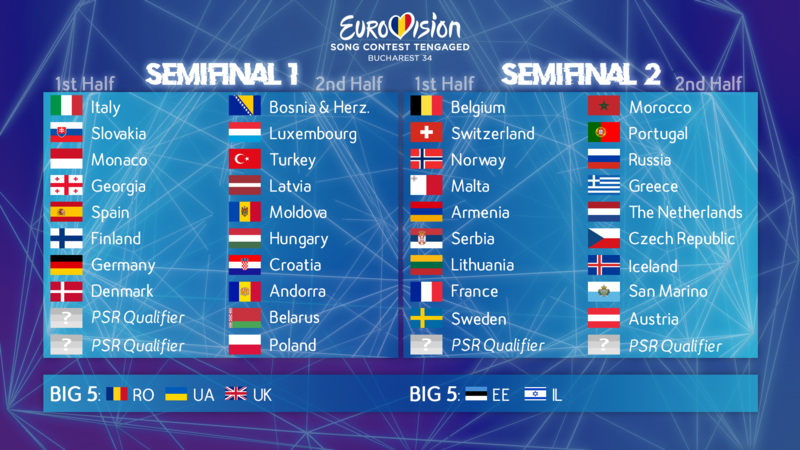 The semifinals allocation draw, took place yesterday when 36 countries were split in two semifinals. The BIG 5 members were also distributed in both semifinals where they will have to vote. The definitive running order will be published coming soon. Azerbaijani Singer Emin is teaming with Ukrainian legend Ani Lorak to try and save Azerbaijan from a PSR death. For personal reasons, I've couldn't been aware of the last circumstances in the forum and therefore I couldn't check many songs along with the council members, or making the reminders and stuff Like this. So, the deadline to post your song has been extended 2 days, until Friday, 19th April. Deadline is next Friday 19th April, just 3 days to go.